The business benefits of moving to the cloud are quite compelling, however, with those benefits come concerns. The most significant challenge facing companies that are either moving to the cloud as a consumer or as a service provider is ensuring the security of the services that are provided. The Cloud Security Alliance (CSA) was formed to help ease this challenge. The CSA’s guidance is adopted as the defacto standard for accessing the security of cloud providers across the software security market. While this guidance has helped greatly, there is still the very challenging question of creating a standard set of questions for organizations to ask a provider in order to understand how they have implemented the CSA guidance. This is where the Consensus Assessments Initiative Questionnaire (CAI) comes into play. 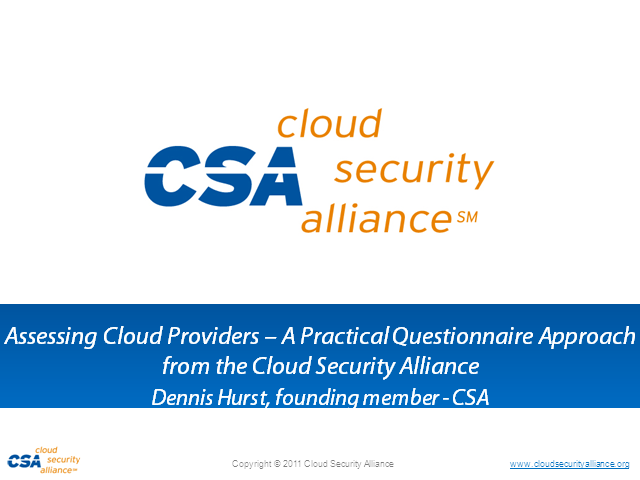 The questionnaire is a CSA-developed tool for both consumers and providers of cloud services to use as common criteria for determining cloud security. This hands-on and prescriptive web seminar will review both the CSA guidance and how the CAI can be used in day-to-day business to help companies assess cloud providers. Attendees will walk away with a firm grasp on the questions to ask or to be prepared to answer- whichever side of the cloud equation they are on.